Normally, the film of a boffo original Broadway musical isn’t made until after the show has closed on Broadway. “Hamilton” may change that custom. The WSJ is reporting that the show may be coming to movie theaters, exactly as audiences saw it on Broadway. Hollywood studios are currently bidding for the big-screen rights to Lin-Manuel Miranda’s hit musical about founding father Alexander Hamilton, according to people involved in sales talks. But in an unusual twist, the “Hamilton” movie won’t be a filmed adaptation. Instead, it is a recording of the show made in 2016 with its original cast, including Mr. Miranda in the lead role. 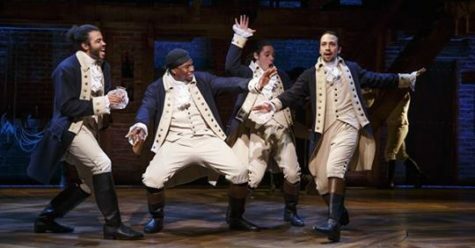 The world-wide theatrical rights for “Hamilton” could sell for more than $50 million, two of the people with knowledge of the deal talks said. Representatives for the production have recently screened the recording for interested buyers.